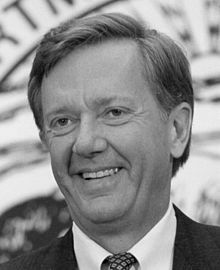 Governor Jerry Brown has enlisted Bruce Babbitt, the former Secretary of Interior under the Clinton administration and former Governor of Arizona, to serve as a “special advisor” to the Brown administration on California WaterFix and other Sacramento-San Joaquin Delta matters. The California Natural Resources Agency did not publicly announce Mr. Babbitt's hire, which is very curious for the appointment of such a prominent former federal official. “We were asked about it by the Sacramento Bee,” said Nancy Vogel, deputy secretary for communications at the California Natural Resources Agency and former reporter for the Sacramento Bee and Los Angeles Times. His salary is approximately $10,000 a month, approximately $120,000 per year, according to Vogel. “The DWR fund used to pay Mr. Babbitt's salary includes several sources of funds. The largest share comes from payments made to DWR from State Water Project contractors,” Vogel said. Babbitt will be pushing for the completion of Jerry Brown’s Delta Tunnels, a Brown “legacy” project opposed by a coalition of recreational anglers, commercial fishermen, Indian Tribes, family farmers, Delta residents, environmental justice advocates and many elected officials. Bob Wright, senior counsel of Friends of the River, told Ellen Knickmeyer of the Associated Press that environmental group leaders want to meet with Babbitt to discuss alternatives to the Delta Tunnels. The Environmental Water Caucus has submitted to state officials “A Sustainable Water Plan for California in May 2014 as a reasonable alternative to the Water Tunnels, but the Brown administration refuses to look at this or other proposals.. The plan can be viewed here.